On June 16 , 2018 we took a Classic Father’s Day Trip to the Norfolk Canyon for some tilefish . Fantastic day , plenty of action and we even checked off something on Kevin’s bucket list. 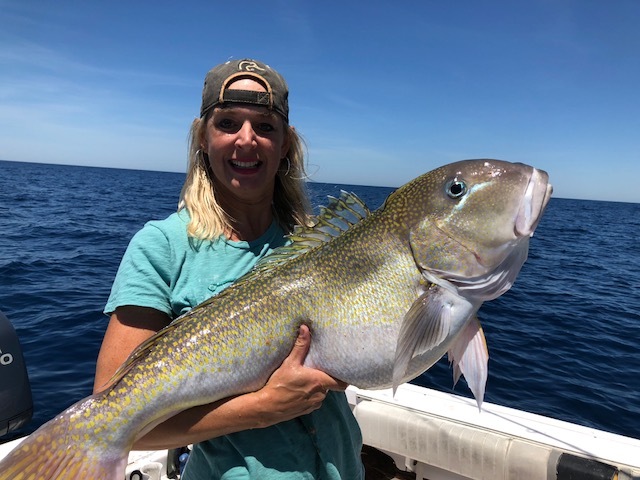 Kevin’s first golden tilefish citation. :) We did 5 drops for Golden’s yielding 6 Golden’s including a double hook up in which Kevin even managed to get the “tail end “ of my fight on a video . This trip yielded 2 citations and plenty of meat for the box. Oh and the best bonus of all came in the form of my bait bill . I had been out of town all week so when he said let’s go , I literally emptied out the contents of my freezer put them in a cooler and we took off . All these Fish hit on previously frozen bait, that had been sitting in my freezer pretty much all winter long. I literally exchanged my freezer contents that I contemplated throwing out true story to quality fresh seafood groceries. So no complaints here , at all. To all the dads out there , Happy Father’s Day !! & Tight Lines Everyone!